Hiking Northbound from Mt. Monadnock, the Spiltoir Shelter was built in the summer of 2006 by the MSGTC, this was originally a tent platform for years. We are thankful that Tom Spiltoir and his family allow us to the have this shelter on their land. This shelter is 6.3 miles from the top of Mt. Monadnock. 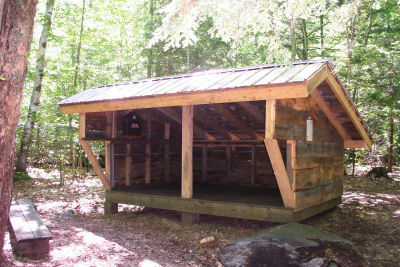 12.1 miles North of the Splitoir Shelter is the Crider Forest Shelter. Built in the fall of 1998 by the MSGTC, this shelter is on SPNHF land. 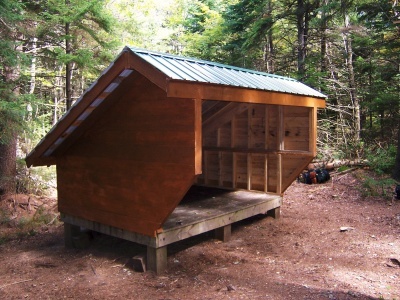 Many of the materials for this shelter were donated by Carlisle Lumber in Stoddard NH. 6.8 miles North of the Crider Forest Shelter is our last primitive campsite and tent platform (tent required). 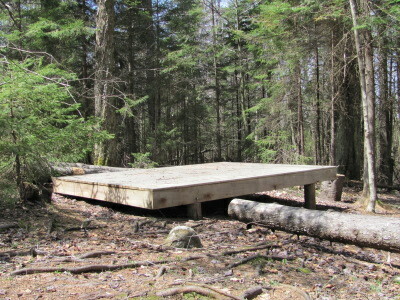 The Fox Brook tent platform was built by the MSGTC in 2007 (your membership dollars at work). In the middle of the Andorra Forest, this site is remote. 13.5 miles North of the Crider Forest Shelter is the General Washington Shelter. This is the oldest shelter on the Greenway Trail system. 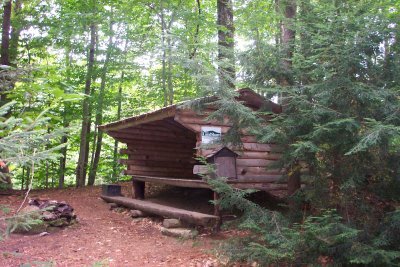 Built on July 23, 1983 by The AMC NH Trail Crew and hosted by Phil Barker and family on their land. Hikers like staying here and walking into Washington Center at night to buy some ice cream at the only store in town. Note, water is available at Phil Barker’s house. Approximately 5 miles North of the General Washington Shelter is the newly constructed Max Israel Shelter completed in September 2009. 11.2 miles North of the General Washington Shelter is the Steve Galpin Shelter at Moose Lookout. 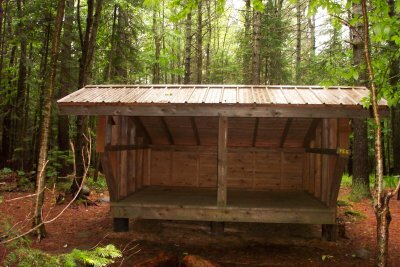 This shelter was completed by the MSGTC in September of 2008. 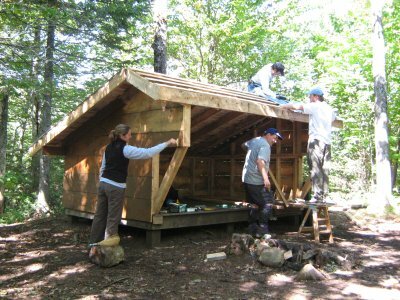 The picture below shows the crew putting the finishing touches on the shelter. Remember no open fires at any Greenway campsite. Reservations are not accepted and there is no guarantee that sites will be unoccupied. Enjoy your stay on the Greenway!